Until scientists perfect bionic vision, shouldn’t there be a better way for the blind to get around than a simple cane? 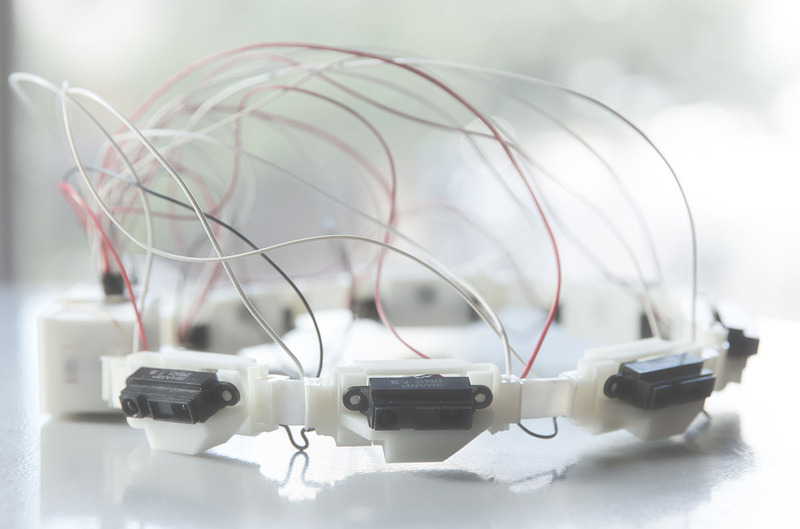 That’s the idea behind Sentiri, a proximity-sensing headband that helps steer users around by motor-driven haptic feedback. It detects objects in the environment using infrared depth sensors, then varies the level of vibrations to the user’s head to help them avoid obstacles. If it’s connected to a smartphone with an app like Google Maps, the tool can also safely guide you from point ‘A’ to point ‘B.’ The company behind it, Chaotic Moon, also created a “haptic language” that transmits extra information to users by changing the frequency, intensity and number of vibrations. Chaotic Moon sees it as more than just a tool for the visually impaired. “This is technology that has the potential for wide use,” said CEO Ben Lamm. For instance, it could also be used by troops to keep radio silence, in a similar way to a belt-worn device tested by the US Army to help keep soldiers’ eyes on the battlefield. By exchanging the infrared sensors for thermal ones, it could also give users a form of haptic night-vision. So far, the company doesn’t have a timeline to release Sentiri, nor a price, but it has been working on the device — originally called Project Halo — for a number of years.